Enjoy this sneak peak recipe for Mixed Leafy Greens from our newly released cookbook "Feel Good Food". It's fall and greens are at their best. Pick some local varieties up now at your local farmstand while their flavors are at their peak. This is just one of the delicious recipes and cooking tips you'll find in our new cookbook Feel Good Food, Recipes from the Hudson Valley's Blue Mountain Bistro-to-Go. If you'd like to own the book and learn all of Chef Richard Erickson's favorite recipes, go to our website and get your copy shipped directly to your home. The popularity of leafy green vegetables has been a bit of a surprise to us here at Bistro-to-Go. We cook 'em every day and they literally fly out the door. And why not? They 're healthy, delicious, and although not hard to cook, they do take a bit of time to clean and prepare. (Not to mention they take up a huge amount of space in a home refrigerator and then cook down to a fraction of their original size.) Our mix varies a bit with the season but usually includes kale, (often times two or three varieties in the summer), collard greens, and Swiss chard. In the winter months when produce is arriving from Florida and elsewhere we use savoy cabbage in place of the chard. Broccoli rabe, beet and turnip greens, mustard greens, dandelion and of course spinach can also be used. Greece and Turkey are home to many greens and these Mediterranean countries have long attributed healing powers to the dark bitter greens. Villagers forage for "horta" or wild greens and gather varieties you could never find on a supermarket shelf. Traditional preparations such as spanakopitta or hortakopitta (mixed green phyllo pie) are famous and reflect the traditions of those cultures. Here in the U.S. greens have traditionally been most popular in the South, famously slow cooked with ham and black eyed peas, and finished with a splash of cider vinegar. Here is a recipe that is easy for the home cook and preserves the fresh clean taste and the flavors of the greens. Remove the tough, fibrous stems of the kale by holding on to the stalk and stripping the leaves. The tender portion of the stem will come off with the leaves; discard the tough stems. For Swiss chard, slice the stems crosswise into 1" pieces, clean, and put to the side. Fill a large sink with water, submerge the greens, and allow to soak for 10 minutes so sand and grit drop to the bottom. Carefully remove greens to a colander so as not to disturb the dirt that has settled; otherwise you might have to wash a second time. For coarser greens, such as collard greens, you will want to finely chop them. 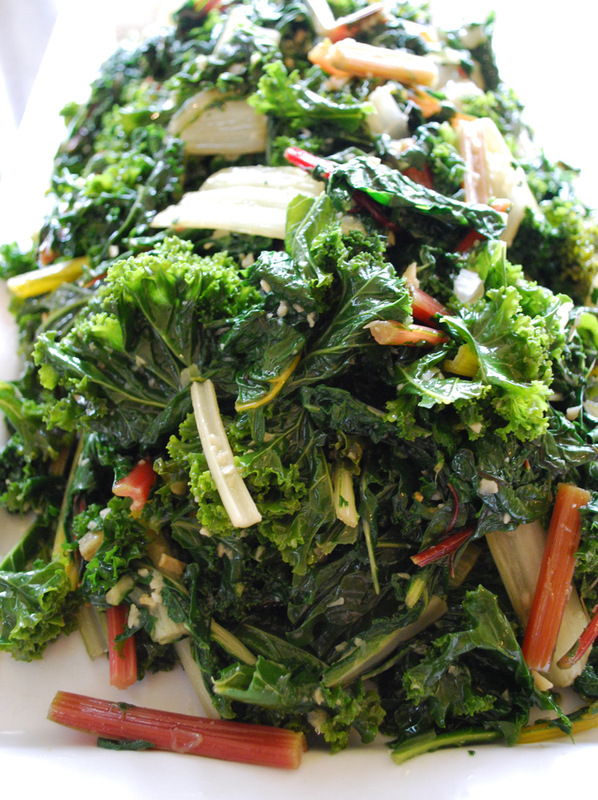 If using delicate greens such as chard may simply be coarsely chopped. Broccoli rabe may be treated similar Swiss chard, the leafy tops will cook faster than the thicker stems. Heat a large soup pot or casserole dish over medium to high heat and add olive oil and garlic. Immediately add chard stems (if using chard) and then the rest of the clean greens with the water still clinging to their leaves to prevent the garlic from browning. Season with a good pinch of salt, cover, and let greens steam 3–4 minutes. Lift the lid and peak in after a minute or so and swish everything around to ensure nothing is sticking to the bottom or burning. Once the greens are soft, remove the lid and continue cooking until the water has evaporated and they’re cooking in just olive oil. If you are using currants, pine nuts, and/or anchovies, add them at this point, along with the vinegar continuing to cook until the greens are tender. These simple additions can elevate what is known in the South as “a mess o’ greens” into something more sophisticated. The whole process shouldn’t take more than 8-10 minutes, depending on the size of your pot and the heat of your burner. Add salt to taste and serve immediately. It is by no means necessary, but if you have garlic confit on hand, it also dresses up those greens. Serve with roast chicken, pork, or with rice and beans.